Why is shopping so enjoyable? Remember that saying, “When the going gets tough, the tough go shopping?” Turns out there’s some truth to that adage. People use retail therapy as a mood enhancer. There seem to be positive consequences to buying yourself a small treat; you often feel better. 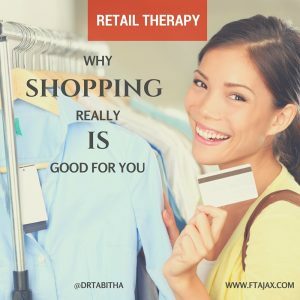 What are reasons why people use retail therapy? 1. Easing transitions—buying a new couch after a divorce or breakup, buying a new outfit for a new job. 2. Relaxation and escape—online shopping is like a mental mini-vacation. Unless purchasing is involved, it can be somewhat of a mindless activity. As a bonus, when faced with a difficult decision or task, short breaks can actually improve performance and decision making. Studies show that our unconscious mind continues to work out problems while we’re engaged in a different activity. 3. Social Connection—What’s better than Black Friday with your best friend? Even if you don’t buy anything, shopping with a friend can be a great way to connect. Can window shopping do the trick? Yes, if you’re just looking for a break, or a way to relax (online or at the mall). Should we save retail therapy as a reward— instead of buying on impulse and why? Yes! Research suggests that retail therapy generally works, when people use it strategically, rather than impulsively, and that there are few if any negative emotional side-effects. However, most people do it more as a mood booster than a way to celebrate. 62% of shoppers had purchased something to cheer themselves up and another 28% had purchased as a form of celebration. Yes, of course! We all enjoy a little retail therapy now and then. Shopping isn’t a problem when it’s done in moderation. The most common warning signs for shopping that’s more the problem than the solution include: avoiding credit card or bank statements, lying or hiding purchases, or missing work, or other obligations to go shopping. If shopping is the only way you can make yourself feel better, you regret what you buy, or you have credit card debit then retail therapy isn’t for you. Retail therapy should not be used as your only way of coping, and certainly not your primary way of coping with a bad mood. Find other healthy (and less expensive options) to cope with not feeling good. If you are struggling to cope with problems in your life and are resorting to using any coping mechanism to it’s extreme (i.e., shopping well beyond your means, excessive drinking, spending exorbitant amounts of money, or sleeping to avoid problems), we encourage you to consider therapy.